My FedEx delivery person is a friendly woman, so chitchat usually ensues during the scrawling of my signature whenever she drops off a package. Last December when making a delivery, she commented on the beautiful pansies in my porch container. Mind you, it was pansies…in December. Not much blooms in December in New England, yet there these pansies were, looking as fresh as daisies in June. “What did you do to them to make them last so long?” she asked. I did absolutely nothing to them. These were the new Cool Wave Pansies (obtained as free plant samples from the breeding company), and they can definitely stand the “cool” temperatures. At that time, the temperatures had definitely dipped down into the low 20s for several days and these plants were still looking great. So, that’s the “Cool” part of the name. The “Wave” part of the name is inspired by the “wave” of vigorously blooming flowers on the plant, similar to what inspired the name of the Wave Petunia (from the same company). 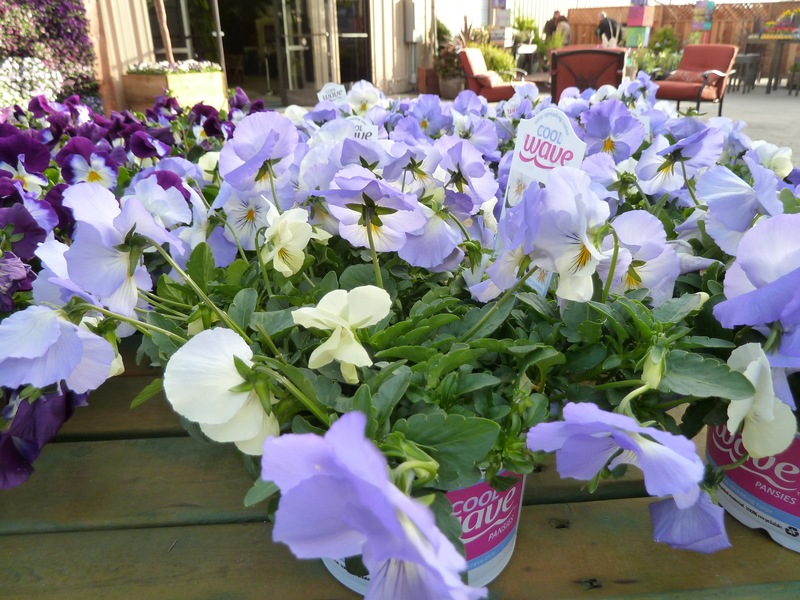 These Cool Wave pansies not only take cool temps, they spread themselves along the ground or trail from hanging baskets, creating a wave of color in the process. My Cool Wave pansies finally succumbed to the cold weather—mostly. They hunkered down under at least a foot of snow on several occasions and, quite honestly, became an unsightly mess. However, in the beginning of March when the snow was finally gone, I noticed that some new growth emerging from the base of each plant and one lone flower that was about to bloom. It was a sad bloom that early on in the season, and it was eventually nipped by (yet another) snow storm. But during this first week of April each plant has about a half inch of new growth sprouting from its base. Resurrection time, indeed. As luck would have it, I received another delivery of pansies to try out during early spring weather. Those are planted up right beside last season’s pansies. Both are still finding their feet as they settle into spring. In less than a month they should all look fabulous and really fill out the container. Spacing: Plant 12 inches apart, or for a lush-looking container, plant 3 plants in a 10- to 12-in. diameter container, basket or planter. Width: They trail to 2 feet in length or more! You are currently reading Cool Wave Pansies for Cool Weather Color at The Dainty Dot.